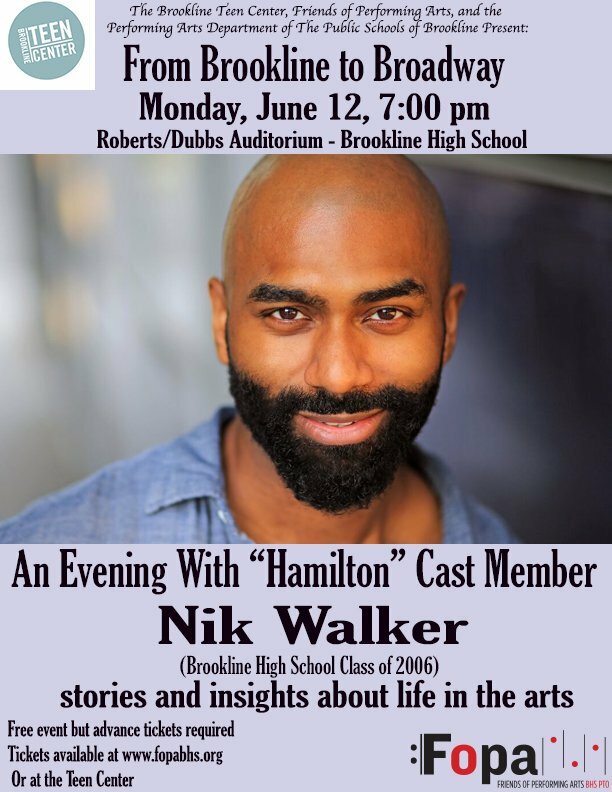 From the Brookline High School stage to the Broadway stage, “Hamilton” actor and 2006 BHS graduate Nik Walker shared his passion for the arts with the Brookline community at a June 12th event, co-hosted by Kenny Kozol, K-12 Performing Arts Curriculum Coordinator of Public Schools of Brookline, with support from the BHS Friends of the Performing Arts (FOPA), The Brookline Teen Center, and the Performing Arts Department of the Public Schools of Brookline. Walked disclosed insight and anecdotes, reminding the audience of the evolution and hard work that it takes to continuously become a better performer. Walker answered questions from performing arts teachers, Summer Williams, Mary Mastandrea, and Mark VanDerzee, all of whom were teachers of his while at BHS. He also took questions from audience members including, one stretch where he and two young students exchanged lines from Hamilton. During his time at BHS, Walker performed in a variety of musicals and plays; he credits BHS and these experiences to helping him flourish as an artist. Walker’s first BHS play was “Antony and Cleopatra”, in which he performed alongside upperclassmen. During the evening, Walker explained how he moved from high school theater, to local theater, to regional theater before making it to Broadway. He shared how teachers at Brookline High School, including Williams and VanDerzee, two of the founders of Company One Theatre in Boston, supported his growth. On the regional circuit, Walker performed in “Miss Saigon,” “Yoshimi Battles the Pink Robots” and more, making appearances at places such as the La Jolla Playhouse in La Jolla and The Old Globe in San Diego, California, as well as the Denver Center in Colorado.